Tight At The Top Of The Over 60’s Men’s League. Game 7 on Tuesday 24th April once more saw wet weather clothing being almost as important as the woods themselves this season with persistent rain through most of the afternoon. This did not dampen the spirits of League Leaders Castletown A though as they travelled to Douglas B and came away with an 8-0 win. The Castletown B side hosted Douglas A and it was the Douglas side that got off to a great start and were 4-0 up after the first half but the Southerners fought back and the game ended in a 5-3 victory for the men from the ‘Villa’. Peel Sunset A travelled to Port St Mary B and achieved a 6-2 success with Brian Lowe and Chris Oates taking the wins for the Port St Mary side. Meanwhile back in Peel the Peel Sunset B team lost 5-3 to a strong Port St Mary A side and Peel Sunset C travelled to Onchan Park where they lost 6-2 to Onchan A with Leslie Halsall and Brian Lindsey taking the two wins for the Westerners. Ballaugh A had a very successful ‘day out’ in Douglas where they beat Nobles Park A 5-3 while the Ballaugh B Team stayed at home and had a 6-2 win over Nobles B with Terry Bates and Brian Atherton being the two winners for the Nobles Park men. Finch Hill A found the visiting North Ramsey A side too strong as the Northerners beat them 6-2 but the North Ramsey B side went down 7-1 to Marown at Crosby with David Thompson being the only winner for the North Ramsey B Team. And finally at Port Erin there was a close battle between the home side and Onchan B which resulted in a 4-4 draw with some close hard fought games. Game 8 on Thursday 26th April saw the Castletown A Team being pushed very hard by a strong Onchan A side at Castletown but the home men ran out 5-3 winners in a match that could quite easily have gone either way as there were some very close games. The Castletown B side travelled to Onchan Park where they were beaten 5-3 by the Onchan B Team also in a close match which could easily have gone either way. Peel Sunset A who are the second placed team in the League played their own B Team and it was the A Team who ran out 7-1 winners with Phillip Clarke being the only winner for the B Team. Peel Sunset C meanwhile held North Ramsey B to a 4-4 draw in a match that saw the Westerners score their first point of the season. Douglas A took a good 7-1 win from Port St Mary A at the Villa with Team Captain Colin Leece being the only winner for the Southerners. Douglas B travelled South to play Port St Mary B and this time the scores were reversed with Bob Banning being the only winner for Douglas B defeating Mike Skelly 21-16. Nobles A hosted South Ramsey and it was the home side that took a 7-1 win with the only winner for South Ramsey being Chas Grills. In the South of the Island Port Erin hosted North Ramsey A in a match that ended in a 4-4 draw. So as Game 8 drew to an end we still had Castletown A topping the League having played 8 games for 16 points closely followed by Peel Sunset A who have played 7 games for 14 points. In third place are Marown who have played 8 games for 14 points and in fourth are Douglas A who have played 7 games for 12 points and in fifth place are Port St Mary A who have played 8 games for 12 points. The qualifier for the Vet’s Merit (Jack and Jean Isherwood Trophy) was played at Douglas Bowling Club on Wednesday 25th April and saw some excellent bowls from the Over 60’s taking part in this Mixed Singles Competition. In the Quarter Finals we saw one of the great games of the day with Stuart Garrett and Janet Monk both playing excellent bowls and Stuey built up an early lead only to be overhauled by Janet in the later stages with Janet winning 21-18. Frank Watson ran out 21-9 winner over Lil Smith and Phillipa Taylor lost 21-12 to Jimmy Sansom. In the remaining Quarter Final Andy Kennish showed good form and Ron Williams who did little wrong lost out 21-13 to Andy. In the Semi Finals we once more saw Andy play well to beat Frank Watson 21-15 and Janet Monk showing that the Ladies can play as well as the Men battled hard in the game with some great bowls but eventually Jimmy Sansom won 21-17. So Andy and Jimmy promised to be a great Final but Andy got on his ‘mark’ and no matter how hard Jimmy tried he couldn’t match him so Andy won 21-10 and will now go on to represent the ‘Island’ in the Final Stages of this Competition in Shropshire. Port St Mary Bowling Club hosted the annual Top Lady Bowling Competition with 32 ladies invited to play. The first round saw some of the favourites fall with current Manx Champion Shelley Kennish losing 21-8 to Chris Price. Last years winner Janet Monk lost to Marown player Rosie Winkle 21-12 and Jenny Moore despite a late fight back lost to home-greener Trish Bull 21-18. Quarter finals saw Katy Williams defeat teammate Chris Price 21-17. Jayne Kneen beat Peel Sunset’s Joyce Kelly 21-15. Castletown bowler Hannah Drewett won 21-15 against last seasons overall merit winner Ann Maddrell and Debbie Leece beat Mary Moffatt 21-11. The first semi final saw a clash of home greeners, also sisters, Jayne Kneen and Katy Williams. After an early exchange of the jack Jayne built up a 11-5 lead. Katy, despite picking up a couple of two’s couldn’t get ahead and Jayne won 21-13 to book her spot in the final. The other semi final between Hannah Drewett and Debbie Leece was nip-tuck all the way and after 27 ends the score was 18-17 to Debbie. Hannah dug in an won back to back twos and came out on top 21-18. In the final, Hannah maintained a lead throughout and at the halfway stage led 12-7 before Jayne came back to trail 15-14. Another surge from Hannah put her 19-14 up and within touching distance of the win. 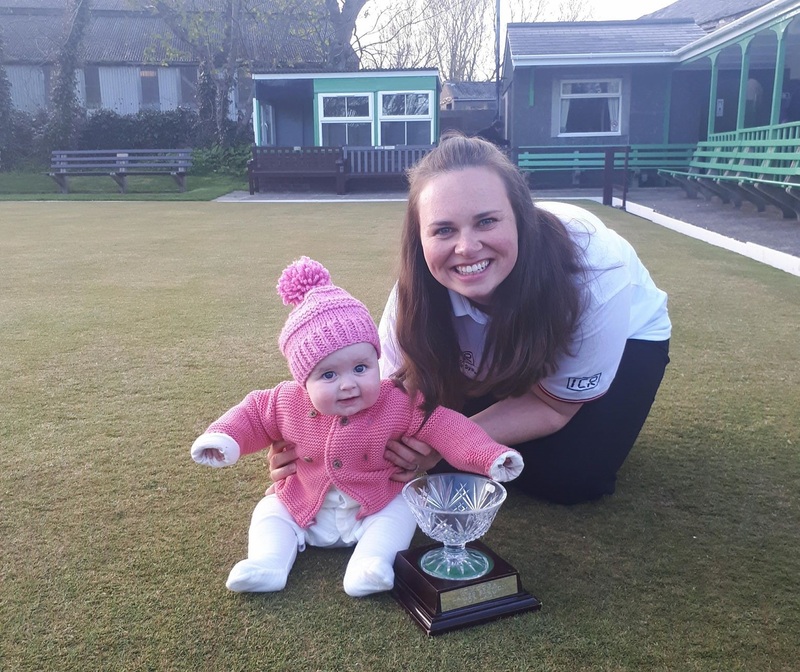 Jayne used all her experience to close the gap but Hannah maintained her high standard of bowling and won her first Top Lady title 21-18. Thanks go to the Association for running the competition and Port St Mary for hosting and providing an excellent playing surface. 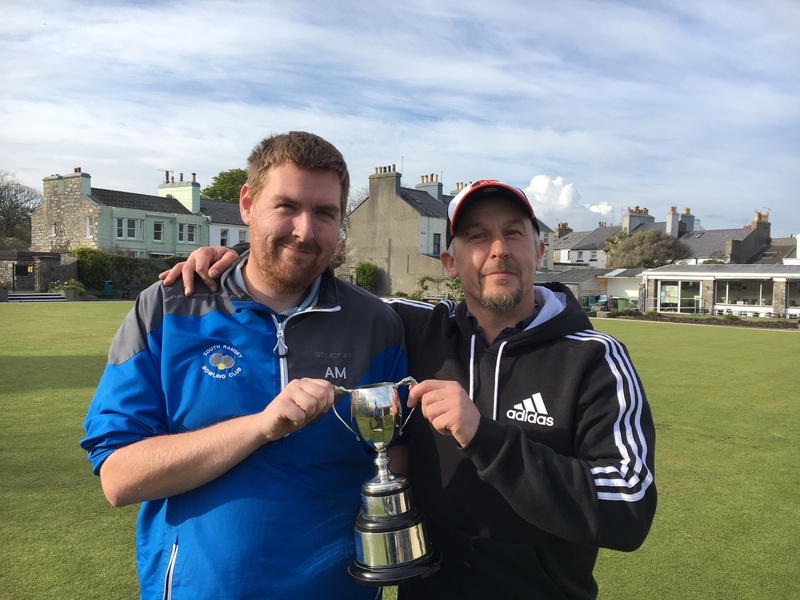 The Cringle Pairs mens doubles event took place at Castletown on Saturday and from a field of 17 pairs it resulted in a win for the South Ramsey pairing of James Teare and Alan Moore who beat the very impressive Port St Mary duo of Tim Williams and Tom Collins 21-14 in the final. 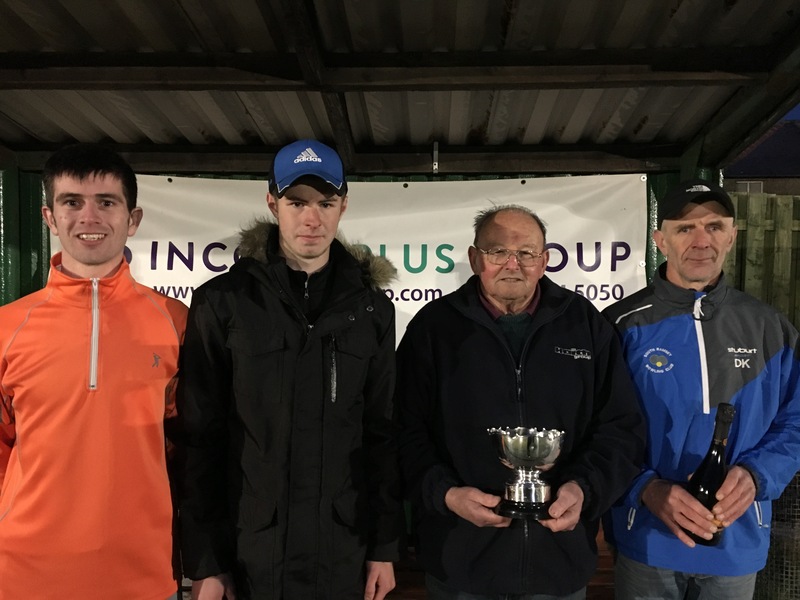 Losers in the the semi finals were Frank Watson (Peel Sunset) and Kevin Firth (Nobles) along with the home pair of Ian Watson and Juan Kermode. This is an annual charity event and the club is extremely grateful to the players and spectators for helping to raise money for the worthwhile cause, to Shoprite for their donations to the raffle but in the main to Mr Noel Cringle OBE, whose family continue to sponsor this event and has done for many years. During the presentation it was announced that a total approaching £200 had been raised and once again it would be donated to the Manx Blind Welfare Society. In division one on Monday evening Peel A made the trip East to take on Douglas A at the Villa and came away with a 7-3 win. The overall result was a lot closer than the score line suggests as Peel took the two points for the aggregate thanks to edging the chalks by five. For the visitors Gary Smith and Ste Kelly had comfortable wins, whilst the other three wins for Peel were a lot closer with David Proctor and Tommy McMeiken winning 21-19 and Jerome Surridge winning 21-20 over Shaun Seal. For the home team captain Andy Kennish won to single figures, whilst Stuart Garrett held of Frank Watson to record a 21-19 win and Merv Sayle beat Peel man Dave ‘Barney’ Kelly 21-17. South Ramsey A took on their B Team on another evening of swirling winds up the North of the Island and the A team recorded an 8-2 win. For the A team Peter Collister, Dido Kelly and Glynn Hargraves all won to single figures. For the B team James Teare performed well to beat Chas Grills 21-14 with the other winner being stand-in captain Tony Dugdale who just got over the line 21-20 thanks to securing a double on the last end. Steven Waters just missed out on the result of the week losing out 19-21 to John Kennish after leading for a large part of the game. The B team will feel confident having now played last season’s top three in their first four games. Marown A extended their lead at the top to five points courtesy of a 10-0 over Douglas B but didn’t have it all their own way with Paul Kelly beating Mark Corrin 21-19 whilst Dean Kipling had his first real test of the season using all experience to get over the line 21-20 against Andy Cannell. Marown recorded this win despite missing three of their regular starters. Port Erin A took on Onchan A at Breagle Glen and whilst losing out 8-2 they did record two good wins with Peter Addison beating visiting captain Peter Slinger 21-17 and Dave McCabe who defeated Kevin Quirk 21-14. North Ramsey A made the journey South to take on Castletown A with the home team recording a 7-3 win they had to work for the victory with captain Ian Watson winning 21-19 and David Quayle winning 21-18. For the visitors the winners were Allan Callow, John Cannan and Steve Parker who all recorded strong wins, however these wins were not quite big enough to take the aggregate losing out by just 3 chalks. Marown B hosted Port St Mary A with the visitors putting out their strongest line up of the season resulting in a 7-3 win for the visitors. For the Home team Juan Killip, Arnie Withers and Bobby Thorne won, whilst Trevor Quayle, Paul Skelly, Rob Cooil and Nathan Hamilton won convincingly with Ewan Cooil having to work harder to beat Steve Bridson 21-19. In the first double set of league fixtures on Wednesday the game of the night on paper was Marown A against Onchan A at Crosby with the Home team winning 7-3 with Peter Slinger going close before losing out 20-21 to Dean Kipling and Steve Crampton losing out 18-21 to Matthew Keggen. For the visitors Kevin Quirk will have been relieved to get over the line 21-20 against Peter Kelly, whilst Matthew Quirk beat Marown captain Paul Dunn 21-18, and Phil Kerruish won to single figures. In the other fixtures Peel A, Douglas A and Port St Mary A all recorded 6-4 home wins over North Ramsey A, Marown B and Douglas B respectively however all three visiting teams will have been pleased to come away with four points each. Castletown A came away from their trip North from South Ramsey B with a 6-4 win, whilst reigning champions South Ramsey A had the longest trip of the night to take on Port Erin A and came away with a strong 9-1 win. In division two Castletown B had another fine week with a 9-1 win over Ballaugh A and a 10-0 win over Nobles B to strengthen their grip at the top. Nobles A had a good week themselves thanks to a 10-0 away win against bottom of the table Port Erin B with Reginald Temporaza continuing his good start to the season in only his second year since taking the game up with a 21-2 win. Nobles A followed this up with an 8-2 home win over Ballaugh A, who may struggle to get back up to division one unless their away form improves considerably. Not far behind the top two of Castletown B and Nobles A are Onchan B who recorded two 8-2 wins with an away win against Port St Mary B and a home win against Port Erin B. In division three Ballaugh B are in second place but have a game in hand over Marown C and they faced bottom of the table Douglas D at home and came away with a good 9-1 win. Marown C kept the pressure on with two good 7-3 away wins to Ballaugh C and Douglas D who despite giving away two games took three points off the visitors. South Ramsey D recorded their first win of the season with a 6-4 home win over Castletown C with the night leagues youngest player nine year old Ryan Hargraves fighting back from 15-20 down to 19-20 and having two good bowls either side of the jack until his opponent Castletown’s Rob Sayle played off his bowl and sat alongside the jack to claim a 21-20 victory. In their other game South Ramsey D made the short journey to take on Ballaugh C, but were sent home with a solitary point following a 9-1 loss with Ian Moore the only winner following a 21-9 win. Ryan Hargraves came closest to adding a second game, however he lost 20-21 after being 20-15 up but was unable to get over the line against Bert Quayle. Peel D visited Castletown C but lost out 3-7 with young Ryan Tate winning his first game of the season courtesy of a 21-20 victory over Clifford Clague who has recently took up the game after spending a lot of time last season watching his Grandson Sam play bowls around the Islands bowling greens. Game 4 of the Ladies League and Friday’s match of the day saw Castletown host South Ramsey. The home side won 6-3 on games however lost the match 164-170. South Ramsey lost six games however each held their own scoring a minimum of 13 and a number of games went down to the wire with Joy Stephens beating Kim Hargraves 21-20 and Heike Perry beating Lyn Bolton 21-20. The difference between the sides was a standout performance from Elaine Moore who won 21-4 to seal the victory for South Ramsey. Port Erin welcomed Nobles to Breagle Glen with the away side unexpectedly picking up a full house winning 118-189. A second whitewash of the evening also came down south as Purt Le Moirrey played Castletown B. The home side put on a strong home performance to win 189-72. Port St Mary travelled to the tricky Peel Sunset green and a solid showing from last years league winners resulted in a win 148-169 (2-7). Shirley Corrin and Mary Moffatt won for Peel and Joyce Kelly just lost to Margaret Tasker 21-20. In the remaining matches Ballaugh lost at home to Onchan 135-144 (5-4) and Marown beat Mooragh Park 169-151. The preliminary rounds of the Jean Kelly competition took place on Wednesday 18th April. The closest match of the night came from South Ramsey who faced Mooragh Park. The visitors started with a 25 point handicap and two big wins from Janet Monk and Caroline Parker only added to the advantage. South Ramsey won six of the nine games but were unable to reduce the deficit losing by 10 chalks 151-161. Current holders Port St Mary played Marown at home with the away team having a 25 point handicap. Port St Mary put on a strong performance at home winning 181-143 (7-2) with Rosie Winkle and Lil Smith winning for Marown. In the other matches Castletown A won away at Douglas 139-179 (1-8) with Paula Garrett the only winner for the home side. Ballaugh faced Port Erin with the visitors winning 141-179 (2-7) and Peel Sunset beat Castletown B 202-180 (6-3). Quarter Final draw Thursday 10th May Onchan (+45) vs Nobles (+15), Castletown A (SCR) vs Mooragh Park (+25) and Purt Le Moirrey (+30) vs Peel Sunset (+25). Tuesday 22nd May Port St Mary (SCR) vs Port Erin (+15). Looking ahead this Saturday Port St Mary host the Top Lady invitation competition. 32 Ladies will compete in the competition, players have qualified by winning their team merit last season with the remaining spots taken from the top placed players in the overall merit. Last years champion Janet Monk will be amongst the 32 ladies. In this weeks Trend sponsored Ladies Over 60s League Tuesday saw three matches end as whitewashes. Port St Mary bounced back from their loss to Marown last week with an emphatic 126-45 (6-0) victory over Breagle who were a player short. Margaret Tasker and Wyn Collister both won to single figures. Marown kept up the pace by picking up their first full house of the season winning away to Mooragh Park B 54-126. Philippa Taylor, Margaret Scarffe and Marcia Pearson winning well for the away side. Peel Sunset also collected their first full house beating Port St Mary B 126-69 with Mary Moffatt, Heather Horsburgh and Lynda Wilson all winning 21-8. Douglas faced Ballaugh who were a player short and lost the match 75-98 (3-3) with Peggy Griffin and Brenda Bowyer putting in fine performances both winning 21-6. Nobles sit out from Thursdays matches and welcomed Onchan to Nobles Park. Slyvia Kennuagh, Viv Cook and Flo Price all won to single figures for the home side to give them a comfortable 107-81 (4-2) victory. Onchan players Maureen Payne won 21-3 and Dee Lewis held on to beat Josie Harding 21-20. Thursdays match of the day came between Mooragh Park A and Peel Sunset. Mooragh Park won the match by six chalks 107-101. Both teams won three games each to underline how tight the match was. Marown won four games in their match against South Ramsey but crucially lost two to single figures making their overall total against South Ramsey well below their league average. They won the match 90-74. Villa locked horns with fellow club members Douglas. Douglas were two players short and won all the other four games including Moire Turner and Jan Osborne winning to 9 and 6 respectively. Despite the result in the four games the 42 chalks given away was too much to claw back and Villa won the match 87-84. Onchan hosted Port St Mary A with the visitors winning 5-1 on games. Maureen Payne won 21-2 against Wyn Collister to prevent a full house and Port St Mary won the match 95-107. Looking at the league table after round 5 it is starting to take shape. As there is an odd number of teams I am looking at the average score of each team and Port St Mary lead the way averaging 115 followed by Nobles 111 and Marown 109. Next week the current top two face each other at Port St Mary. Peel Sunset A are pushing to take the lead in the Over 60’s. As we came to Game 5 on Tuesday 17th April we were asking ourselves whether or not Castletown A could maintain their early season form as they travelled to South Ramsey and their 6-2 win in the North of the Island showed us that they certainly could. The two winners for the South Ramsey side were Chas Grills and Robert Callister. The Castletown B side hosted Onchan A and it was only fitting that in a match with a number of very close games that the end result would be a 4-4 draw. Ballaugh A had a visit from Peel Sunset B and after a strong attempt from the men from the Sunset City to take the honours it ended in another 4-4 draw. Douglas A hosted Port St Mary A at the ‘Villa’ and this resulted in a 7-1 win for the home side but it has to be said that the Southerners made them battle for every game with some very close results. In what could only be described as an epic game Stuart Garrett eventually managed to pip Bernard Thackrah 21-20 and Pat O’Donohue also had a 21-20 win over Ken Karran. The Douglas B side travelled the short distance to Nobles Park to play a strong Nobles A team and it was the Nobles side who took the points here with a 6-2 victory with the winners for the Douglas B side being Bob Banning and Arthur Ashcroft. Finch Hill A had a 6-2 home win over Nobles B with Brian Atherton and Chris Duggan being the winners for the Nobles B side in a match that also had some close battles with John Harris for the home side edging Tony Jones 21-18 and Peter Woods and Brian Cain of Nobles B also just going down 21-18. Onchan B hosted a good Marown side and it was the Crosby men who took the honours 5-3 at Onchan Park in what appears to have been a competitive match. Port Erin had a visit from Ballaugh B in what would seem to have been a really tough match with some close results and at the end it was the home side that run out as 5-3 winners. North Ramsey B travelled to Port St Mary B and the Southerners won this 6-2 with the winners for North Ramsey B being David Lacey and David Thompson. Game 6 saw Castletown A once more putting on a good show in beating Ballaugh A 7-1 at Castletown. Bob Unsworth being the only Ballaugh A winner in this one as he beat George Peach 21-16. The Castletown B side who are currently only three places behind the A Team in the League also managed a good win beating Nobles B 5-3 at Nobles Park. Peel Sunset A who are serious challengers for the ‘League’ this season travelled to Onchan Park and came away with a good 5-3 win over Onchan A which keeps them in contention for a high League position. The Peel Sunset B Team also had a good 5-3 win over North Ramsey A in the Sunset City while the Peel Sunset C men lost 6-2 to Douglas A. Port St Mary A got back to winning ways with a 6-2 win over Finch Hill A with Billy Long and Arthur Halsall picking up wins for the Finch Hill side. Port St Mary B travelled to Ballaugh where the home side took a 6-2 win with Colin Leece and Brian Lowe picking up wins for the Southerners. Douglas B hosted Onchan B at the ‘Villa’ and despite good wins from David Galbraith and the consistent Bob Banning the Douglas men lost 6-2. In a close match at Crosby South Ramsey put up a spirited fight but lost out 5-3 to a good Marown side. So at the end of another week of Over 60’s Bowls we have Castletown A holding the lead with 12 points but Peel Sunset A who have a game in hand are only 2 points behind them and are level on points with Marown on 10 poiints. Only 1 point separate’s the next five Teams which in order are Castletown B, Nobles A, Douglas A, Onchan A and Port St Mary A. The Income Plus Services sponsored Jim Senior Team Fours was held on Sunday at South Ramsey with 19 teams taking part which resulted in the games being played as two pairs instead of the usual doubles and two singles games with the team with the highest chalks taking the win in each tie. The competition was a massive success with the aim being to raise £1,000 in favour of Rebecca House Children’s Hospice. This target was easily surpassed thanks to the generosity of the local bowling fraternity who dug deep for this very worthy cause with £1,400 being raised thanks in part to those who couldn’t be there but still purchased raffle tickets ahead of the day. This amount will be topped up by a further £1,000 by Barclays to give a grand total of £2,400 to be passed on to Rebecca House Children’s Hospice in memory of Sophie Kelly, which is a charity close to the heart of the family of Dido and Lisa Kelly following the loss of their daughter last year. In what was a fitting tribute to Sophie, the winners at the end of a long day were Sophie’s brother Stefan Kelly, Dad Dido Kelly and Grandad Alan Kelly ably backed up by Onchan’s Jordan Cain. They held off the home team of Lyn Bolton, Sid Bolton, Steven Waters and included Wayne Roberts (Port St Mary) to record a win of 38-31 in the final. It was great to see Alan Kelly back playing and he defied his years to play superbly throughout the day to help his team win. Losing out at the semi final stage to the eventual winners by eight chalks (34-42) were the Ballaugh Team of Patrick Grant, Steve Grant, Tony Quine and Edward Trustham, along with the Ladies Team of Lil Smith, Mary Alderson, Elaine Moore and Gill Dixon who lost out by just five chalks (31-36). The presentation was made by South Ramsey Chairman Steve Moore and thanks were given to the sponsors Income Plus Services and everyone for their generosity. Thanks were also given to Glynn Hargraves for organising and selling the raffle, all the club members who contributed in anyway from those running the competition, to the Ladies for providing the top notch refreshments throughout the day. Not to forget the improvement on the green and to those who helped on and off the green to prepare for the competition. In Dido’s speech he became understandably emotional and thanked everyone who made today possible as Rebecca House had helped the family so much. The winner of the 2 foot passenger IOM Steam Packet vouchers was Gill Morgan who eventually claimed her prize after purchasing £20 worth of raffle tickets! The Association Singles was held on Saturday afternoon at Douglas Bowling Club on a superb surface. The winner was David Bradford (South Ramsey) who defeated Dave ‘Barney’ Kelly in the final to 21-12. Losing out at the semi final stage were Stefan Kelly (South Ramsey) and Edward Carlyle (Onchan). Losers at the quarter final stage were South Ramsey’s John Kennish, Glynn Hargraves, Wayne Roberts (Port St Mary) and Walter McCarthy (Marown). The presentation was made by competition secretary Matthew Keggen who thanked Douglas for hosting the competition, providing the refreshments and for preparing a superb green.